Brazil – During a knee surgery her knee nerve was cut. She could only walk carefully with crutches. The knee could not bent anymore. 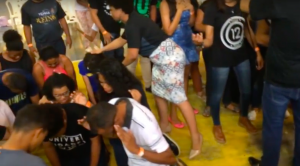 After the prayer and laying up hands on her knee the nerve was instantly restored ! Jesus is awesome !